Who doesn't love the luxurious feel of cashmere? 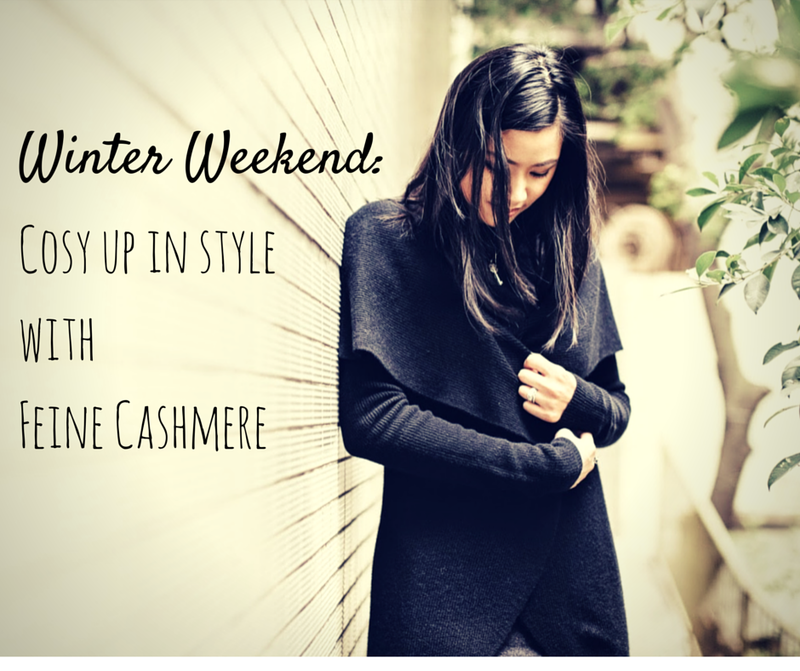 We recently teamed up with the very talented Justin Lim from Justin Lim Photography (www.justlimphoto.com) to feature a variety of cashmere looks from boutique store Feine Cashmere that you can cozy up in for any occasion, all weekend long. Hit the read more button below to see the rest of Justin's amazing photos! Start the weekend early and get comfortable without compromising on style with the Cashmere Cloud Dress (US$177). I love the intense blue of the Navy option, which is sure to brighten up any dreary winter's day. The round collar and capped sleeves give the dress a youthful appeal and the drop waist and floaty skirt hide any side effects of winter hibernation eating. Layer up with a pashmina, a cardi or warm coat during the mid-winter months, or wear with sheer leggings or stockings in the lead up to spring. Being Australian, I'm a firm believer in casual Fridays - but sometimes a girl needs to balance that out with a versatile day-to-night outfit that can take you straight from the office and out to the bar for Friday night drinks. This dark grey stretch top is perfect for a relaxed look in the office, and is loose and comfortable enough to let you get away with enjoying a few too many glasses of vino with colleagues at lunch time on Friday (yes, like I said - I'm Australian!). Feine Cashmere offers a range of these designer t-shirts (some in rayon and some in light linen) to complement their collection, all at incredibly affordable prices. For those who want to add a bit of texture and shape, throw on the Ultrafine Cashmere Pashmina scarf (US$170), which is incredibly soft and large enough to be twisted and wrapped in a variety of ways, so it will look like it's a different accessory every time you wear it. Match this outfit with a pair of ankle boots or stilettos, and throw on some chunky accessories to liven up this beautiful dark shade. A must-have item in any winter wardrobe is a coat or cardi which you can wear over anything and still look great - the Double Layer Front Cashmere Coat in black (US$320) is ideal with its flattering and feminine shape and versatility. I absolutely adore this look. Keep your fingers toasty with these Hand Knitted Cashmere Hobo Gloves (US$69). I think it's a neat feature that you can turn these gloves into mittens and cover up for complete warmth or wear them with half-fingers for delicate operations like taking photos! Had a big Friday night out but need to see the boyfriend's parents on Saturday for lunch? No problem - grab the Ultimate V-neck Cashmere Jumper in ivory (US$135), which is sure to make your skin look a little brighter and your eyes a bit livelier. The soft cashmere is flattering but modest, gently hugging your curves in all the right places. Pair them with a pair of dark jeans or fitted pants. Add some sparkle with embellishments and colour with the Sparkly Cashmere Dress (US$195), which comes in Anthra (pictured below) and Dark Red. With beaded feature capped sleeves and a fitted A-line silhouette, stay warm but glam on your next wintry date night. I especially love the rich warm red option teamed with a black wrap for a colour combination that stands out from the crowd. There is nothing I love more than snuggling at home in oversized, silky soft shawls. This Big Fur Cashmere Cape in Brownie (US$280) lets me do that outdoors - and with badass, rockstar style. For those who are not a fan of fur, Feine Cashmere offers a few other great cape options without the fur. The piece has been designed so that it drapes beautifully to around mid-thigh level, meaning it's time to crack out those knee or thigh high boots to give yourself that sultry, femme fatale look - and knock your date dead! Get rugged up and stuck into a good book with the super soft and comfy Belted Wrap Cashmere Coat (US$225) on your next lazy Sunday in. Sundays to me are all about being comfortable and kicking back with casual clothes that are fuss-free, but leave you still feeling stylish and fresh before the new week starts. I love pairing this super fine and light Soho Cashmere Hoodie (US$178) with a pair of skinny jeans. The light ginger balances out the starch, distressed blue of my jeans and is perfect for taking out to a casual Sunday brunch with friends. Teardrop Pendant Necklace (US$175) - Tiffany & Co.
1837 Interlocking Rings (US$250) - Tiffany & Co.
PS. Don't forget to follow our talented photographer Justin on Instagram (@hurtingbombz). You look so beautiful with your amazing cashmere clothing, thanks for sharing. I love the cashmere cloud dress.